Proprietary SmartBezel increases sales by actively communicating $1, $5, $10, $20 bill acceptance in real time..
Centric drive technology compensates for skewed bill insertions, ensuring highest first time acceptance..
Quick-release bezel speeds installation and removal, improving access while reducing service costs..
Three levels of anti-stringing technology provide superior cheat resistance.. Capture new customers with eye-catching impulse lights..
Sculpted 360° illuminated bezel offers ease of bill insertion, improving the consumer purchasing experience.. Automated self-diagnostics ensure optimal performance resulting in fewer service calls..
To convert from a 27 volt Maka NB2 add harness listed in pull down box that says "Add 24 Volt Harness and Maka Conversion Harness". 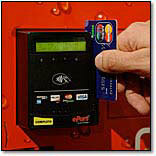 This will allow you to convert the older style USI and club store machines to use a newer style validator.